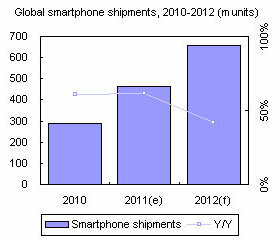 Global smartphone shipments are forecast to top 464 million units in 2011, with Apple being the top ranking vendor in terms of shipment volume, followed by Samsung Electronics and Nokia. However, Samsung Electronics will overtake Apple in 2012 to be the world's largest vendor by volume, while HTC will be third-ranked unseating Nokia. Rounding out the Top 10 will be: RIM in fifth place, followed by Huawei, Sony, ZTE, LG Electronics and Motorola Mobility. This Digitimes Special Report analyzes the key trends in the market and provides a detailed forecast of each of the Top 10 vendors in the smartphone market. Chart 19: Will Android follow step of Symbian?